Gerry was licensed as a certified public accountant in 1979. 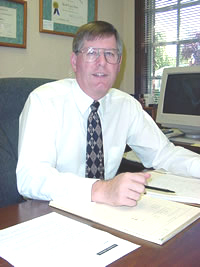 He has been employed in public accounting since 1976, and has been with Hoots, Baker & Wiley, P.C. since 1977. Performs and supervises accounting and management advisory services for numerous businesses and non-profit organizations. Performs and supervises tax planning and return preparation services for corporations, partnerships, estates, trusts, and individuals. Functions as supervisor and lead auditor on a variety of audits, including non-profit organizations, construction contractors and retirement plans. Holds a B.S. degree in business administration, with areas of concentration in accounting, corporate finance and banking. 1976 honors graduate from Oregon State University.